First founded in 1924, the Hugo Boss brand epitomises authentic, understated luxury. Now renowned around the world for their progressive looks infused with an urban and edgy attitude, this bold German fashion house has been designing exceptionally high-end men’s, womenswear and accessories for nearly a century. Bringing forth modern and refined evening looks alongside sporty, fashion-forward pieces for the weekend, Hugo Boss consistently set stylish accents to ensure you’re always one step ahead of the style curve. Synonymous with a classic yet inspiring elegance, Hugo Boss’s confident aesthetics are effortlessly transferred to their premium watch collections. Combining long-loved designs and the finest materials with imaginative detailing and unconventional finishes, Hugo Boss watches exude confidence, superior style and timeless sophistication. The biggest trend to date, make an impression with these powerful Hugo Boss styles. Luxurious and modern, be envied by all with these Hugo Boss rose gold watches. These Hugo Boss watches with a blue dial are the sophisticated splash of colour you’ve been waiting for. 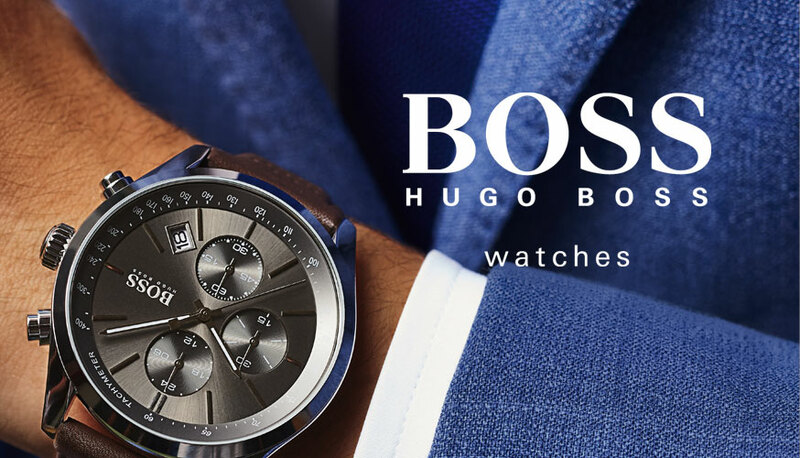 Our go-to brand for occasions that demand sleek, sophisticated style without shouting too loud, we love the clean designs and sharp lines that come as standard with a Hugo Boss timepiece. Handpicked for their excellence, here are our favourites. Giving you a self-confident and stylish accent to every look, here are your top picks from the Hugo Boss collection.